Play tent for children, wigwam from my-teepee, natural materials, Made in Germany, colour blue/grey. The beautiful, carefully crafted teepee is perfect for young and old Indians and the perfect place to play or hide. Playing with my-teepee really is harmless fun. You can be absolutely sure of that. The label ?Confidence in Textiles" is only awarded if all criteria are met according to the strict Eco-Tex standard 100 (S17-3012 HOHENSTEIN HTTI). All fabrics for my-teepee tents are therefore only produced in Germany under strictly controlled conditions - for your children and for their health. Only natural materials? Absolutely! Only materials that are 100% natural are used in my-teepee tents. You?ll really be able to feel the difference - a wonderfully tactile experience for children and adults alike. With my-teepee you get to have a little piece of nature inside your home. What?s not to like? my-teepee tents are completely plastic free. And on this matter we really are perfectionists. Even the support threads, borders and ribbons are made of cotton or linen. Goodbye synthetic fibers - hello all natural materials! As manufacturers of high-quality, plastic-free toys, we go to great lengths to ensure this. For kids, my-teepee is a play tent. For adults it?s a tasteful accessory. Subtle pastel tones and delicate patterns ensure both aesthetics and a sense of well-being in every living and play area. Play has never looked so good. my-teepee is made in our manufactory in the German Ore mountains. Why? Their amazing attention to detail is quite frankly second to none. The materials are all sanded, cut and sewn by hand and lovingly transformed into the quality toy that is my-teepee. Who goes there? Through a round window, children can keep an eye on things outside. Quick as a flash, any secret objects can be hidden in my-teepee's inner pockets when mommy or daddy are spied walking past. Curtain down, tent door closed and shh! Phew, a lucky escape! The tent is delivered complete, there is no assembly required. The tipi is suitable for both indoor and outdoor (e.g. sun protection in garden). If it is not even needed, you can store it in the dust bag. Sad as it may be, we don?t expect to be hearing from you any time soon. 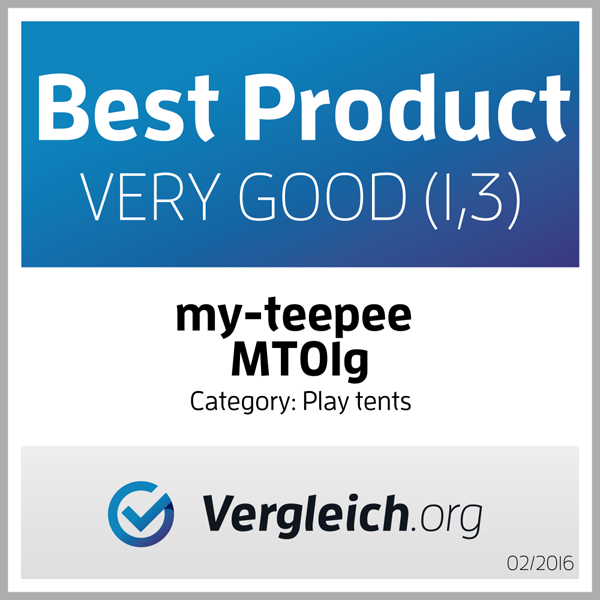 myteepee tents are produced to the highest standards of quality and sustainability. In fact, we are so convinced of the quality of our my-teepee tents that we even offer a10 year manufacturer warranty. We deliver your order free of shipment costs within the EU to you.